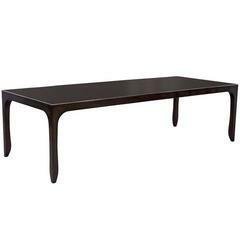 Custom modern Macassar dining table with Art Deco inspiration. 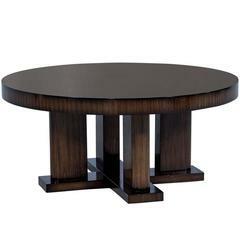 Carrocel custom made dining table, modern sleek design with two pedestal columns accented with a brass detail. 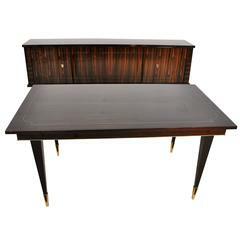 Table opens up for two table extensions which can be hidden in the centre compartment. Dimensions: Closed W 72, H 30, D 44 Opened W 90, H 30, D 44. 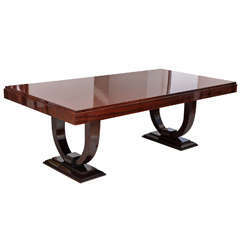 Customers can modify the size, finish color, wood type and metal accent finish. Please inquire with your desired look and we can price accordingly. Das rechteckige Formoberteil ist auf stilisierten lyri-förmigen Endstützen aufgezogen. Mit zwei 20 "Blätter. Ohne Blätter, misst 88" lang.